Centrally located close to Copacabana and Ipanema, the Atlantis Copacabana Hotel offers comfort, safety and comprehensive service. 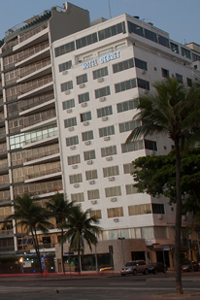 Ideal for business travelers who want to enjoy the best of what Rio de Janeiro has to offer. Come and visit us! When would you like to stay at Atlantis Copacabana Hotel ? 1) Rates at the Atlantis Copacabana Hotel may not be valid during Carnival, New Years, Easter and other special dates.